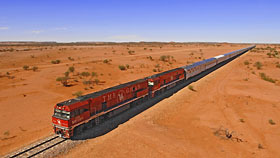 The Ghan crosses the continent from Adelaide in South Australia to Darwin in the Northern Territory, a distance of 2,979km. The journey takes 3 days and includes stops in Alice Springs and Katherine. Typically including 30 coaches and requiring two locomotives, the train is a fantastic way to experience the diverse scenery of Australia, from rolling green hills in the south, through the rusty red centre and on to the tropical splendour of the Top End.